August 19, 2010 - Avfuel Corporation has announced a new branding alliance with luxury aviation services provider X Jet FBO of Denver, Colorado (APA). The agreement means that X Jet will offer AVTRIP point awards to pilots on qualifying fuel purchases, and also has Avfuel Contract Fuel pricing for jet fuel savings. Avfuel supplies fuel and related services, including quality assurance, safety training and customer service know-how to the X Jet FBO. As is customary, each company retains full independence under the branding agreement. 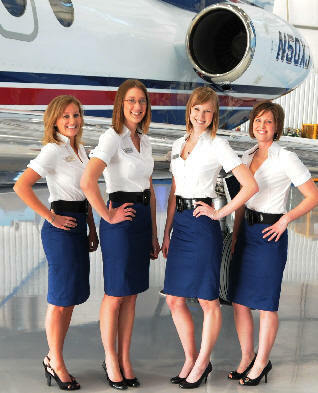 ?X Jet FBO is a new executive aviation service provider serving the Denver area with the kind of service that attracts loyal and repeat customers. The modern setting and commitment to smart, savvy service is refreshing. "Avfuel looks forward to doing business with X Jet for a long time to come,? said Director of Marketing Marci Ammerman. ?We agree with their motto: What?s not to love?? Located at Denver?s Centennial Airport (APA), X Jet FBO boasts award-winning facilities competitive pricing, and touts its ?Seven Star Service.? Indeed comprehensive concierge service for lodging, ground and air travel, as well as dining is available 24 hours a day year round for maximum customer convenience. ?X Jet is delighted to be partnering with such a recognized leader and respected brand as Avfuel,? says X Jet President & Founder Josh Stewart, ?X Jet has proven its revolutionary club model and is now excited to be offering its award winning facilities and Seven Star Service to transient customers through this partnership.? Amenities and capabilities include climate-controlled hangar space, garage parking and auto spa, maintenance facilities, meeting space, pilot lounge, a fuel farm and more. X Jet FBO provides the finest in aircraft safety and security, as well as a first-class private environment for the most discerning customer. X Jet is offering triple AVTRIP points per gallon until December 1, 2010. Avfuel Corporation serves the global aviation industry via a network of 600 Avfuel-branded dealers and over 1,000 fueling locations worldwide where Avfuel Contract Fuel is available. Avfuel is the leading independent supplier of aviation fuels and services to FBOs as well as to a diverse market of specialty carriers including airlines, freight companies, military special operations, helicopter users, and corporate flight departments. An Avfuel-branded FBO is an independent FBO for whom Avfuel supplies fuel, services and business solutions, including AVTRIP and the jet fuel savings program, Avfuel Contract Fuel. Avfuel also offers flight-planning services for domestic and international customers. Avfuel supports 600 Avfuel branded dealers and 2,500 other aviation customers nationwide. Headquartered in Ann Arbor, Michigan, Avfuel was founded in the early 1970's and has been under the leadership of Craig R. Sincock since 1984. During that time, Avfuel has grown from a regional focus of approximately eight states to currently servicing customers in fifty states, Canada, Mexico and Europe.